Some argue that the only event that put Chernobyl right in the spotlight that tragic calamity. It is useless to keep chewing on the details of the event once again since we know them too well. We need to highlight, however, that the evacuation process was very quick. Lightning fast, in fact. The relocation of the population happened alongside emptying entire cities including not only towns, but also villages and smaller settlements. Farmers and town folk were moved as well. Within hours after the fateful blast, enough transportation to relocate thousands of people was provided. Less than a day, and the whole city turned into an abandon wasteland stripped of all life. So strange to realize that an accident that occurred within seconds destroyed livelihoods that had been building for years and what we believed had future. Today, we see that devastating cataclysm as a nightmare. However, some of people who survived that catastrophe and moved on with their lives may still see an image of a city of tomorrow in their dreams. Today, Chernobyl is a city frozen permanently in Soviet times. Small, with clean and empty green streets, made up of inconspicuous grey two-storey buildings, Chernobyl lies in a dreamlike state. Before the accident at the ChAES, the population reached around 13,000 people, now fallen to a mere 4,000 (the entire ChZO is home to 5,000). Only rarely do you come across another human being here, and local traffic is limited to an old Soviet bus which drives around the streets several times a day for the workers. There are few inhabited buildings here – a few dozen, mostly concentrated in the centre. But the infrastructure of the town, despite the almost total exclusion of this settlement, continues to develop, albeit very slowly. The flow of tourists has given birth to a new demand and supply – the city is beginning to take on a second life. In the building of the abandoned bus station and fire brigade headquarters, village shops are open for business, selling mostly essential supplies (including alcohol, of which a wide assortment is on offer). Payment can even be made by credit card and there are souvenirs for sale: tee-shirts with the legend “Chernobyl”, “apocalyptic” fridge magnets with depictions of the power station and nuclear mushroom clouds, and pink pens with radioactivity symbols on. Two hotels have opened in the town: one in a refurnished former boarding house (with small three to four person rooms), and the second in a house once occupied by Party workers (a seven person room in a renovated three-room flat). The large Soviet canteen is in operation, and the Desyatka café opened its doors quite recently, providing a place to eat cheaply and use Wi-Fi in the bar. A curfew is still in place, though the locals no longer appear to take it particularly seriously. 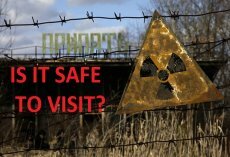 The present day inhabitants of Chernobyl are mostly forestry workers, ecologists, scientists, technical personnel at the power station, and Ukrainian Interior Ministry officials who guard against illegal penetration of the 30 km zone. Chernobyl itself holds the basic industries engaged in keeping the territory in an ecologically safe condition. They monitor the radioactivity of the waters of the River Pripyat, its tributaries, and the surrounding air.